I just got back from my three-day trip in Frutillar, a really small city located in the southern Los Lagos region of Chile. This city was a bit more to the south of Chile. If you kind of want an idea, the bus ride to Pucón the week before was about 8 hours. This bus ride was about 11 hours; however, it was paid for by the municipality of Frutillar along with a hostel!! And oh man did they hook us up. The buses to go to other cities are usually split up into different classes with “semi-cama” being the generic seats and “cama” is the suite seats. The municipality bought us “cama” seats which is SUCH a difference from its plain counterpart. I usually cannot fall asleep on buses, but I slept like a baby on these plushy, wide chairs with a footrest, pillow and blankets. Furthermore, the audio for the on-bus movie is much better and the staff provides you with food throughout the trip. Even better was the hostel we got to stay at. Welcome to Hospedaje von Bishchuffshausen. 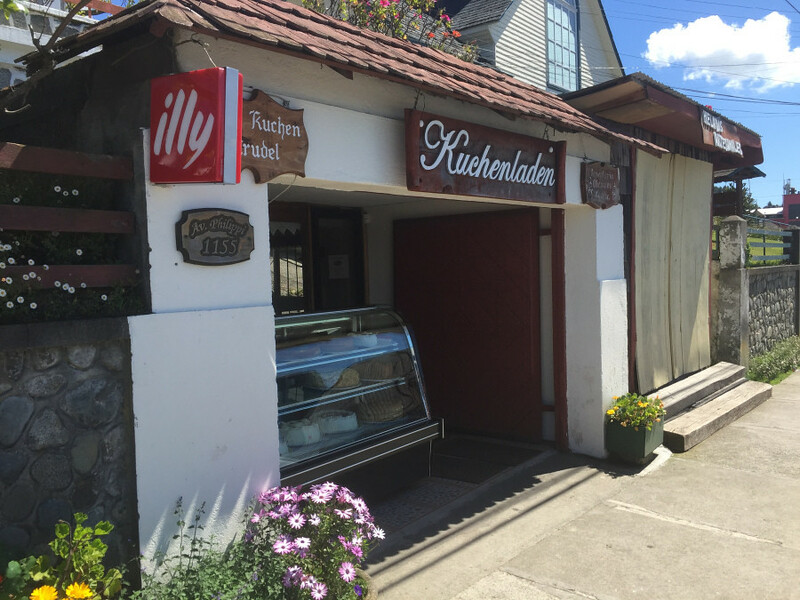 Now I know you are wondering: “Why is there is a German-named hotel in Chile?” Well, Frutillar, as well as several different parts of Chile, has a lot of history of German colonization. Thus, there is a lot of German culture and people in those parts. Now before I digress too much, I should probably explain what I am doing here and why the municipality of Frutillar paid for my trip and stay. Well, for my Public Proyects class (Proyectos Publicos), I have a group project where a group of other students and I have to do research on a certain public policy issue and try to come up with a way to tackle it. While a majority of project topics were based in Santiago, there were that were based outside and my group was fortunate to land one in Frutillar. Our public policy issue is about trying to get workers with disabilities more involved and represented in the labor market in Frutillar. Furthermore, we actually get into contact with the municipality of the city we are working in to do our research and Frutillar’s was generous enough to pay for my group’s travel and stay. The way my group conducted researched throughout our stay was through a series of interviews with people with disabilities, disabled workers, employers of disabled workers, professors/teachers for people with disabilities, and municipality workers. My friend Karl and I both shot videos of the interviews in order to then hopefully turn it into a small movie in the end which my group and I will present to the municipality and our class. The research overall went great and I think my group gathered more than enough to provide a thorough presentation to the municipality of Frutillar. Listening to the perspectives of various different people, all in situations distinct from each other, really opened up my mind to the issues and struggles others face everyday. I do not think I am legally allowed to provide you guys any information in this blog about the people and what we learned, but hearing the accounts I have been told during the interviews, I understand now that I must not see matters in solely black and white because there is a gamut of factors that come into play. Although our research is more just analyzing the current situation of disabled people in the labor market, I hope our effort is able to cause some sort of change in the municipality and in the labor market to be more inclusive of those with disabilities. While the interviews took up most of our day, we dd have free time during the afternoon and a bit in the morning. During that free time, we spent plenty of time at Lake Llanquihue, walking around Frutillar’s center, visiting historical sights and we even got to take part in a march against violence towards to women. Beautiful display home that used to belong to German colonists. Visitors of them museum are allowed to enter all of the buildings, but cannot touch the items of course. Did you know dandelion in Spanish is “diente de león” which translates to “lion’s teeth”? Frutillar had to be one of the most beautiful cities I have visited while here in Chile. It is also incredibly small and one could see it all in one to two days MAX. Thus, I would definitely future visitors of Chile to stay a weekend in Frutillar preferably before November since that is when more tourists start flooding the city. Since I went in October where it is a little cold in Frutillar, there was barely tourists there and the lake was almost always empty. To end this on a cheesy note, I am truly blessed to be able to go on this trip and see the astonishing sights I saw. I am very much thankful for this amazing opportunity.